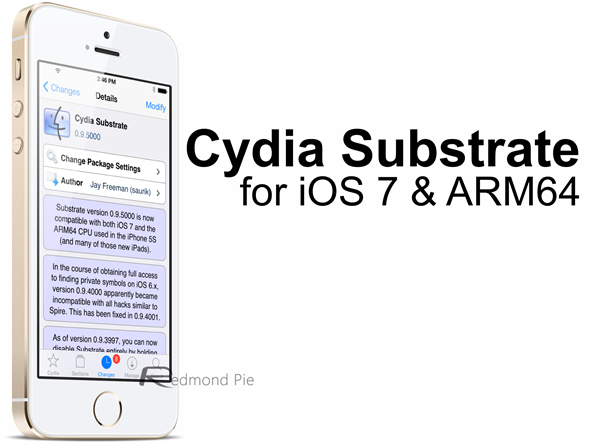 Cydia Substrate (Formerly Mobile Substrate) For iOS 7 & 64-bit Devices Released In Cydia! Jay Freeman, the creator and maintainer of the alternative App Store for jailbroken devices, has updated Cydia Substrate (formerly Mobile Substrate) to version 0.9.5000. The recently released Evasi0n7 jailbreak managed to take everyone by surprise, including Freeman himself, but today’s news means that the final piece of the jailbreak puzzle is in place, leaving developers free to update their packages and extensions for Apple’s latest 64-bit devices such as the iPhone 5s and iPad Air. The Evasi0n7 jailbreak has been with us for a week or so now, and although it is capable of successfully liberating all devices capable of running iOS 7.x it has been rendered somewhat useless from an end-user perspective without a functioning version of Cydia Substrate. Freeman, probably better known by his online name of Saurik, has acted swiftly to make Cydia iOS 7 friendly as well as pushing out this version of Substrate that stitches extensions and the operating system together. We may not be over the final hurdle in terms of achieving a fully functioning jailbreak experience for 64-bit devices, but we can now finally see the finishing line. The availability of an updated Cydia Substrate means that developers will no longer have to find inventive ways around the limitations of the jailbreak. Updating packages and recompiling for ARM64 shouldn’t actually take that long so we should start to see a barrage of tweak updates landing on the default repositories fairly soon. For those that don’t know about Substrate or what all the fuss is about then it’s worth knowing that it’s one of the most integral parts of a consumer facing jailbreak. Cydia Substrate is the framework that allows developers to provide run-time patches to default system functions within Apple’s mobile operating system. It’s also the framework that provides protection against system failures by putting the device into Safe Mode if anything goes wrong. If you followed our previous guide on: How To Fix MobileSubstrate Tweaks On iOS 7 Without Any Side Effects and installed the “Mobile Substrate Fix” package, it is important to uninstall it before installing the new Cydia Substrate update from Saurik. “Mobile Substrate Fix” package can be uninstalled by navigating to Cydia –> Manage –> Packages. The new Cydia Substrate package can be installed by navigating to Cydia –> Changes and then tap on “Upgrade” from the top right.